At some point in most car owners’ lives, they will experience the pitfalls of a window tint installation gone horribly wrong–many times, at their own hands, with a DIY kit. Luckily, there’s one surefire way to fix improperly installed car window tinting on your AZ vehicle. As car enthusiasts, we understand the appeal of applying a DIY tint kit on your vehicle. It takes skill to apply window tint, and there’s a certain sense of pride that comes with modifying your vehicle on your own. All too often, unfortunately, our Valley customers come to us asking for help fixing their handiwork. With that in mind, our #1 tip is to seek out a professional for your automotive tint replacement. A tinting professional can replace the car window tinting on your AZ using the proper tools, chemicals, and techniques, ensuring that your window tint is fixed properly–without damaging your vehicle. Tint removal is an involved process. Instead of attempting use ammonia and razorblades on your car, rely on the tools and expertise of a window tinting technician. Our technicians are able to remove even low-quality window tints from your windows without damaging your vehicle, giving you a clean slate for your next professional window tint installation. Fixing the car window tinting on your AZ vehicle is much harder than simply going with a professional in the first place, but we can help undo mistakes. Let an expert take care of your installation and you’ll see results that exceed beyond your expectations. 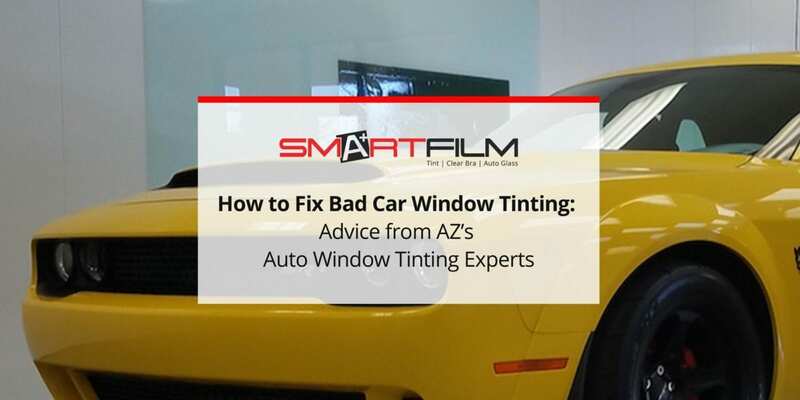 Leave Your Car Window Tinting to the AZ Auto Tint Experts at Smartfilm! Give us a call to learn more about the car window tinting services AZ customers like you can benefit from today!